Very excited to be bringing back Mediterraneo for a mighty summer edition on June 4th at Summerhall. Presented with Nothing Ever Happens Here, this time we are partying for Europe – with a special ‘Europe Calling’ concert! In the shadow of the EU referendum, come join us for a mighty dance fueled celebration of live music from across the continent… #ceilidhtostay! 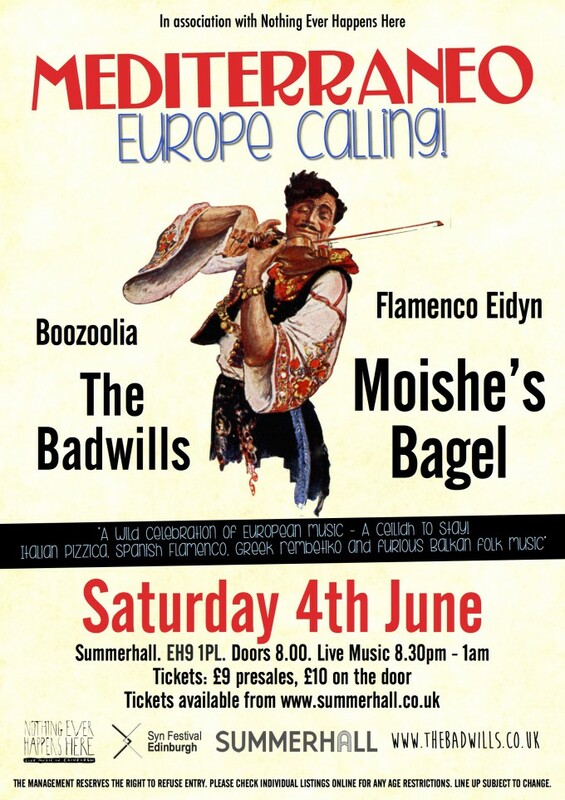 Adrenaline-charged eastern European folk music maestros Moishe’s Bagel headline, alongside hosts and Edinburgh’s favourite tambourine toting Italian pizzica bandits The Badwills. Rounding off the line up are Greek rembetiko and folk merchants Boozoolia and Spanish roots aficionados Flamenco Eidyn, for what promises to be the biggest and best Mediterraneo yet!